Ok so I thought I was about 8 weeks and 2 days and I started bleeding. I went to the Emergency room and had and ultersound done. The lady that did it was a newby and had never seen twins before. She had no idea if they were identical or not. Only one fetal pole was found and she THINKS she saw a heartbeat. I do have a small leak on my aminioic sac so I may be miscarrying one or both of them. I am currently on bed rest. I go back tomorrow to get blood work where they test to see if my hormones are going up or down. I'm very scared and want both babies. 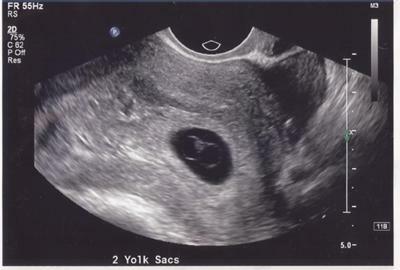 I wish the other fetal pole showed up with a heartbeat and I would have felt a little better. The waiting is terrible. My levels from the blood test kept going up and five days later I had another ultrasound done that showed I was indeed pregnant with identical twins and there were no longer any heart beats. I took my Doctors advice and took medicine to miscarry them quickly because I was in school and work. It took two full days to completely miscarry. This all happened last June and I am still dealing with my loss.